Someone wasted no time adding Shepard Smith calling Robin Williams a coward for killing himself to Wikipedia. It has since been removed, but as you can see above, search engines still captured the change. Smith has since issued an apology, but we all know that was just done as damage control. Smith also committed a flub a few years ago on live television about Jennifer Lopez giving or getting blow jobs. I'm not exactly sure which one. I frankly don't care about Smith's apology. He let us know how he really feels about this situation and he's entitled to his opinion. However, it just so happens to be a terrible one. A lot of people have been writing and posting about what Robin Williams meant to them. Some from celebrities like the Twitter story that Norm MacDonald told, and others expressing their grief by telling the stories of what Robin Williams meant to them. I'm not going to pretend like I actually knew him, but there's something about growing up with someone on your television that makes you feel that way. 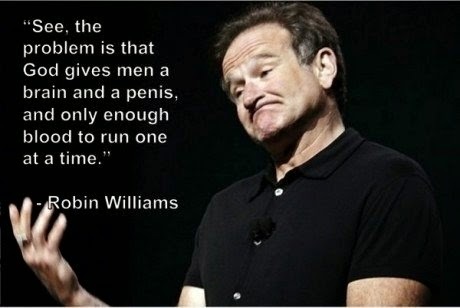 Everyone has their demons, and there's no one who knows that better than a comedian. There's something screwed up about us that makes us want to do comedy. Humor can be a defense mechanism, and even a weapon at times. I don't know what his demons were, but he touched a lot of people. He made us laugh despite whatever he was going through at every step of the way. I grew up watching Mork & Mindy and with his stand up. He's one of the people that inspired me to want to be a comedian...and in some ways discouraged me, because he was so damn good at it. I felt like I could never be that good. I can only imagine what his family must be feeling and going through right now. A close friend of mine killed himself a few years ago and that's left a scar that I will carry with me forever. Was there something I could have done? Could I have prevented this somehow? Regardless of the answers that you'll never get, there's now a gaping hole in your world. The world of comedy now has a gigantic hole in it. There's no amount of success, money, or drugs that can take away your demons. You have to struggle to deal with them yourself, and recognize when you need help doing it. Don't be too proud to reach out for help. One of the creepiest things I have found on the internet in the wake of his suicide is this message board that someone posted a few days ago, last Friday, with the headline "Are people bracing themselves for the fact that Robin Williams will die soon?" Another website, which clearly has never heard the phrase "too soon," has started a backlash of all of the love and mourning for the death of Robin Williams. The article mocks those of us who dare to remember and mourn the loss of a comedy genius. It never surprises me how cruel people can be. A lot of us were inspired and touched by Robin Williams. Deal with it.